Indra Jones racks up airline miles, thanks to her profession as a software solutions specialist for a global company, but even frequent travelers need a home base. 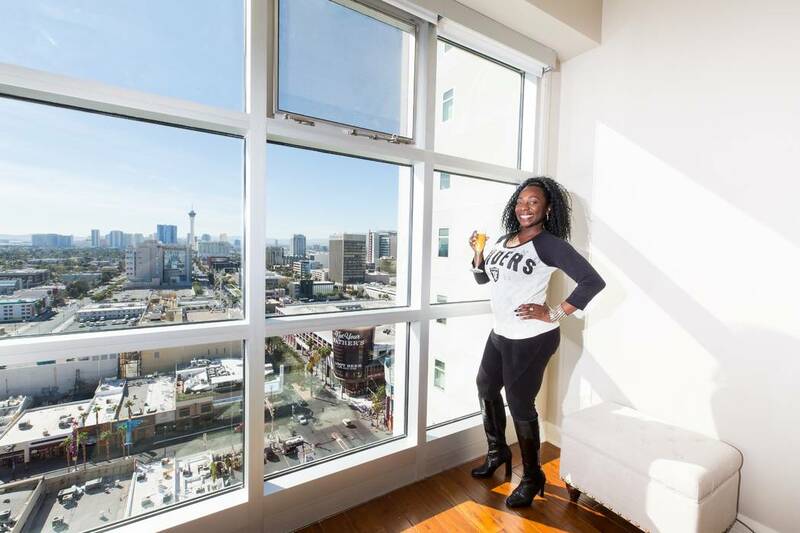 Having lived in Oakland most of her life and being a die-hard NFL Raiders fan, she recently relocated to The Ogden, a 21-story high-rise condominium tower in the heart of downtown Las Vegas. Her career allows her to live and work from anywhere, but when she decided it was time for a lifestyle change, Jones knew she wanted to stay west. “Last year, I did a lot of traveling to the East Coast, which often meant a connection flight into Las Vegas. I remember always thinking, “If I lived here, I’d be home by now.” Increasing rent rates and an overall high cost of living drove me to start looking at other cities. But in my heart, I always knew I’d end up in Las Vegas, and now that I’ve purchased my residence at The Ogden, I know I made the right choice,” Jones said. Jones considers herself a true city dweller because she’s always gravitated toward the urban lifestyle and high-rise living options of most metropolitan areas. She did extensive online research and explored many high-rise communities in the valley, but downtown Las Vegas fit the bill perfectly. “I’m accustomed to having access to concierge, great views and proximity to a bustling food and social scene, but I didn’t want to live on the Strip because of the traffic. Jones purchased the Hesse floor plan, a 1,180-square-foot, two-bedroom, two-bath home that features hardwood floors, stainless steel appliances and floor-to-ceiling windows. Jones is also a singer, who has already been fortunate enough to sing at local casinos. And as a loyal NFL Raiders fan and season ticket holder, she looks forward to watching her favorite team play in their new stadium here. “Evelyn, the lifestyle director, does such a great job hosting resident mixers! As someone who is single and ready to mingle, I look forward to participating in more resident events and getting to know my neighbors,” Jones said. Right outside the front door of The Ogden are more than 150 restaurants, many of them among the city’s most popular eateries, bars, attractions and an energy that continues to build with ongoing redevelopment of downtown Las Vegas. The Ogden offers flexible financing options, including Veterans Affairs- and Fannie Mae-backed loans. Available homes at The Ogden range from a two-bedroom, 1,180-square-foot residence priced from the mid-$300,000s to a three-bedroom-plus-den, 2,044-square-foot home, starting in the low $500,000s. The Ogden’s single-story, open floor plans offer flex spaces that can serve as a home office, den or yoga room, extra bedrooms for accommodating multigenerational family and guests, and expansive windows that fill interiors with natural light.